PuzzleJig is a jigsaw puzzle game for Windows, just try it ! Jigsaw Puzzle Game - PuzzleJig creates sliding-block puzzles out of any .bmp and .jpeg file, and then lets you solve them. The game isn't hard to play. If you get stuck, the program can show you a move. PuzzleJig also tells you how many pieces are in the correct position -- plus it will let you look at the assembled image at any time. You can save unfinished puzzles for later completion. Registration removes the nag screens and lets you create puzzles with more than 25 pieces and you can choose any number of pieces, with or without rotation. 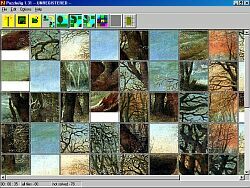 Create custom puzzle from bitmap and jpeg files. Create a custom puzzle by drag-and-drop files. Mark pices on right place. Handle the pieces comfortably with your mouse. Viewing picture in real size to help you solve the puzzle. Puzzles now always saved in TrueColor for best reproduction.